Purple chatoyant Charoite stones with birds in flight on the front and hand stamped on the back with inspirational phrase “I believe I can fly”. Statement bracelet. Lastest work from my bench. Owyhee jasper. Looks like a modern painting doesn’t it? Glitterbug. A pendant with abundant joy to share. A size 7 ring left and average size opal cuff bracelet on right. Newest additions in my shop. Handmade and solid sterling silver. Solid sterling silver. Fun and flirty for the rebel in you. Carved bone and red coral handcrafted in sterling. Newly listed. Just added 9 new cabs to my shop including these 3 with more coming n the next few days. Sterling silver and a rare variscite stone. Size 7 ring. Just added. A new multi-link bracelet now available. Add a matching ring or pendant? Several new pieces newly finished and waiting to be added to UntwistedSister. It's the season for Lizard Love. Southwest style with an Australian boulder opal. Latest addition to UntwistedSister.com. Shattuckite solid sterling ring. The latest addition available at UntwistedSister. Royston Ribbon turquoise & sterling silver. See the cat ghost? Unique stone cabochon. Sterling opal pendant ready to go or purchase a custom stone for your creation or mine. Newest addition. Lucky frog and Orion variscite. Interchangeable bracelet starts with basic infinity. Add one of a kind focal stones. Heavy solid sterling silver with carnelian in 14k gold bezel. These 3 new pieces are now listed at UntwistedSister. Sterling silver jellyfish pendant with hidden bail features a hand cut tube agate. Rare purple Fordite cuff bracelet. jellyfish pendant. tube agate stone and sterling silver. "stingless 3"
Reversible pendant. Opalized petrified wood and seahorse in sterling silver. 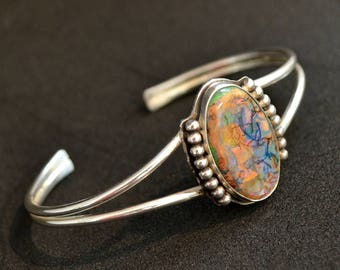 Sterling Opal cuff bracelet . Fits up to 7 inch wrist. Sterling silver earrings. Silver dangle earrings. Rebel earrings. Wire wrap Bracelet TUTORIAL only. Traditional style with top closure and beaded accents.